The Revd Stanley Wakeling was instituted as Vicar of South Nutfield in 1973. He had hardly settled in before announcing that he wanted a magazine for the whole village, not just for those already in his flock. 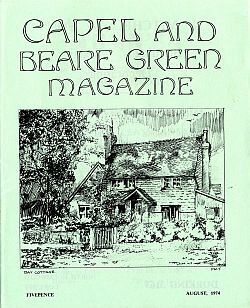 Peter & Margaret Finch had friends at Capel, and had seen the 20-page duplicated magazine produced there. It contained the usual details of church services, baptisms, marriages and burials, and a letter from the Vicar. But it also contained news of cricket and football, and all the other village organisations, so it appealed to all villagers, church-goers and non-church-goers alike. And the whole thing was edited, printed, bound and distributed by village volunteers. Stanley Wakeling liked the concept, and decided to invite all Nutfield organisations to send a delegate to a meeting to discuss the idea. The meeting was not immediately convinced, and wanted to explore the prospects for a commercially-printed magazine as well as the Capel model. Comparative costs were presented at a meeting on 22 October 1973, and showed that the commercial version would be 45% more expensive. Only the home-produced version looked economically viable. At a selling price of 5p, and with advertising revenue of £48 per annum, it was calculated to break even on average sales of 430 copies. It was agreed to press the button for a January issue in 1974. One drawback of the DIY version was that it required some equipment. George Whittle, proprietor of South Nutfield Garage, solved one problem. He allowed the magazine to use his Gestetner duplicator. The drawback was that it had to be transported from his workshop office to Ridge Green and back again every month. The other vital piece of equipment was a long-carriage typewriter. An old one was donated by a business colleague of one of the committee. We also needed two Long-arm staplers, and these were purchased. It was originally proposed to call the magazine Nutfield News. However, it transpired that Nutfield Priory School for the Deaf already had a magazine with this name. The Editor came up with the name Nutfield Link. She claimed that the idea came to her in a dream. The idea was that the magazine would help to bind together the two villages of Nutfield and South Nutfield, as there was in those days some rivalry and mutual suspicion between them. It was agreed to set up a committee of management which would reflect the management structure of a commercial magazine publisher. The initial team consisted of the Revd Stanley Wakeling (Chairman), Myles Crabb (Secretary), Roy Pitcairn (Treasurer), Miss Constance Chandler (Editor), Peter Finch (Production Manager), Jean Ashby (Circulation Manager), and George Whittle (Advertisement Manager). Each had a specific area of responsibility, and they did not get in each other’s way. The structure worked well, and 33 years later it remains unchanged. It was expected that the finances of the magazine would run on a shoe-string. A retired bank manager who was approached re the post of auditor said that it would be a nine day’s wonder, and would not survive. Roy Pitcairn, manager of the local branch of the Woolwich Building Society, thought otherwise. He took on the job of Treasurer and ran a very tight ship. The bulk of the magazine’s revenue came in early in the year from reader’s subscriptions, and was spent gradually through the year. There was rarely much more than £100 in the bank at the end of the year. All members of the Committee were required to accept joint responsibility for discharging debts should the magazine go broke. This was taken very seriously, and one member declined to sign as the risk to the family finances was perceived to be too great. The sale of copies was reckoned to be the principal source of revenue. As noted above, break-even level was 430 copies. The Committee set itself a target of 550 copies. After the initial subscription drive, we had 474 paid-up subscribers; below target, but above break-even. At the end of 1974 the committee made a budget for the magazine’s second year. Despite increased production costs, mainly from rapidly rising paper prices, the Committee projected a surplus of £100.